Happy Monday friends! 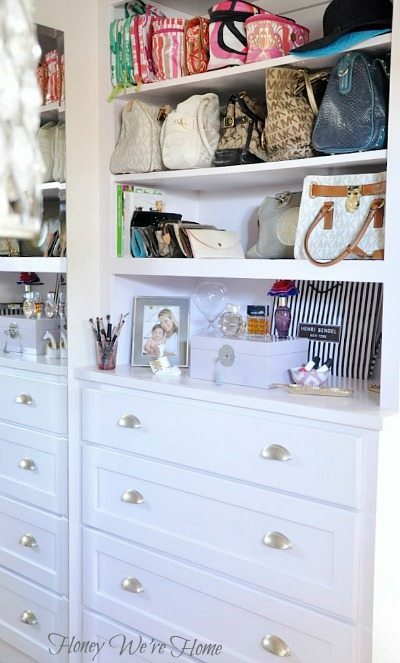 I spend a chunk of time last week organizing my closet and redoing the built-in dresser. It was originally painted Sherwin Williams Divine White (flat) which resulted in lots of scuff marks that were impossible to clean, so I repainted it Sherwin Williams Venus Pink (high gloss). The island and shoe shelves are also now that shade of pale pink. I moved my handbags and travel totes to the shelves above the dresser so I can see them more easily (they were hidden behind the door before). To help the purses keep their shape, I have them stuffed with thick tissue or small pillows I’m not using. I spray painted the silver drawer pulls gold and added decorative paper to the sides with adhesive spray. I rearranged the contents inside the drawers too. I used to have jewelry in the top drawer and makeup on the dresser top, but I donated the pieces I never wore and moved the makeup into the first drawer, except for the brushes, that I like to keep upright in a cup. With the top of the dresser clear, I had room to style it up with accessories and girlie things. The nameplate bracelet is traditional Hawaiian jewelry that I got from my Grandma when I was young and she lived in Hawaii. I still cherish it and wear it all the time. I adore this old photo of my parents from over 30 years ago (wow! ), so I decided to tape it to the jewelry box where I could see it everyday. Love it! 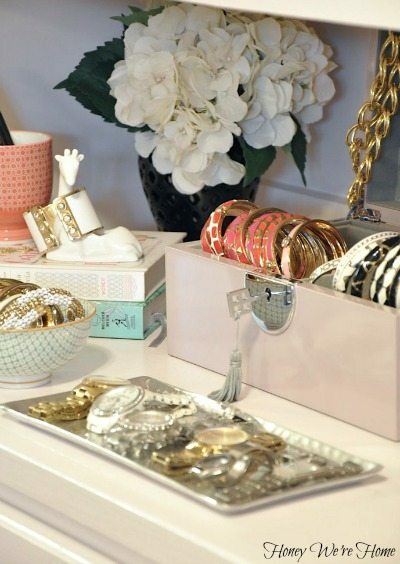 I hope to organize my jewelry and perfumes once I buy a new dresser for our master bedroom. 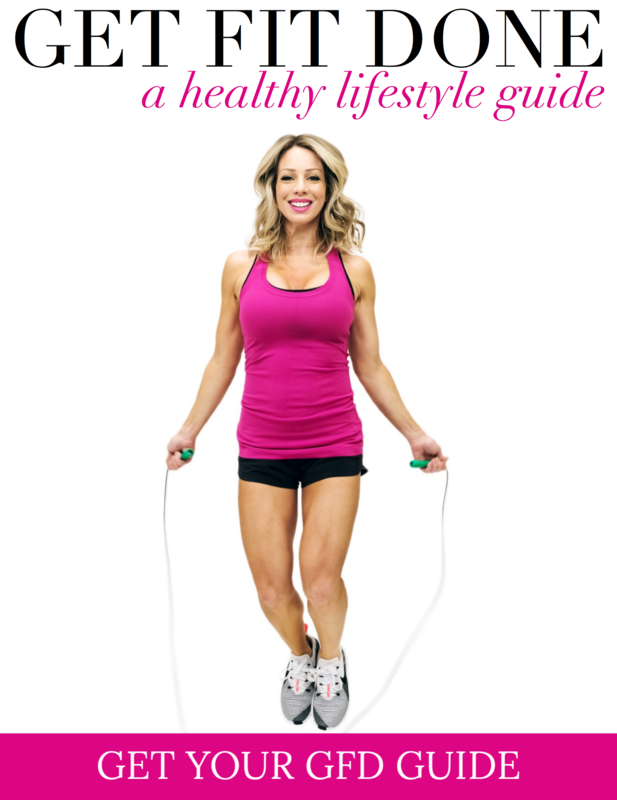 Definitely using this for inspiration. Looks amazing Megan! So organized and efficient. Been working on our closet, but due to lack of space it has been super challenging. Love the picture of your parents. Great job – I have plans for a closet overhaul and cannot wait! My goodness! It looks like it's straight out of a fashion magazine. I adore the gold, and your accessories are beautiful! Thanks for the motivation. I'll be cleaning out my closet this week! Love the paper lined drawers! 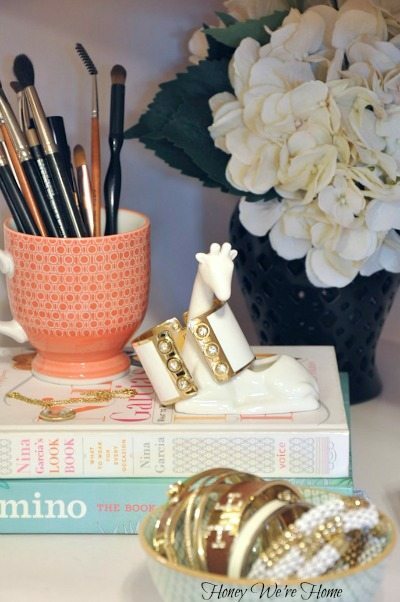 I have a question, though — what happened to the tiered bracelet stand you purchased from amazon? I've been planning on buying one based off of seeing it in your space, but it got mixed reviews. Did you move it elsewhere or get rid of it altogether for one reason or another? Ugh, have to finish tackling my closet this week. 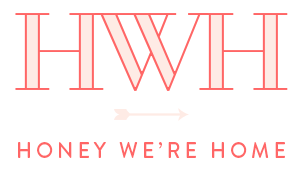 I sold a bunch of stuff and donated some clothes…still have organizing to do. Your mom looks so stylish! What a great photo. Courtney said it! We should ALL have your hand bag collection (and your closet for that matter!). Great job!! Your closet is probably the ultimate closet! What a peaceful place to get ready in the morning! I love the pic of your parents…that's a great idea! Girl, I didn't think your closet could shine anymore. Lovely. SO darling with the paper on the drawers. And what a handbag collection. I want to go shopping in there! What an adorable photo of your parents! So sweet! So great! Love that paper and I am seriously impressed with your jewelry collection. Your closet is beautiful! 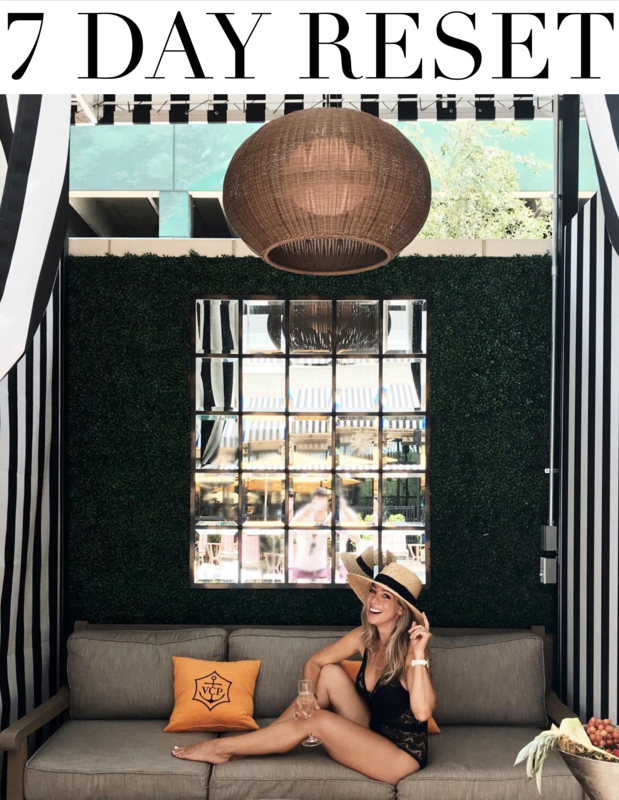 You've made it such a fabulous space Megan. I love the photo of your sweet parents. That is a lovely photo of the two of them. What a wonderful collection of handbags and bracelets! Venus Pink looks like a lovely pink. Pretty and feminine. I"ll have to get a swatch of that color. beautiful Megan! 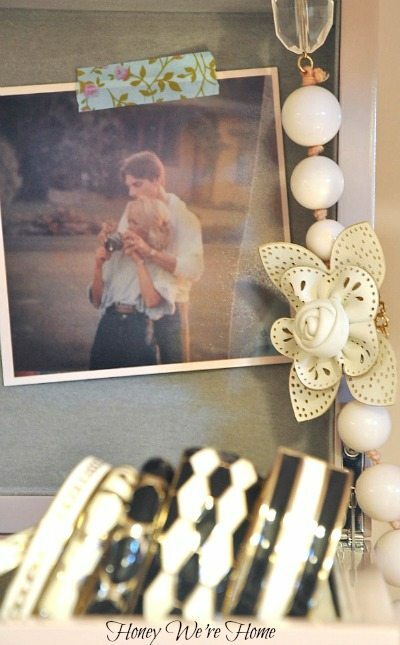 Love how you vamped up the sides of your dresser. I have always just loved your closet Megan! I'd given anything for a bigger closet. 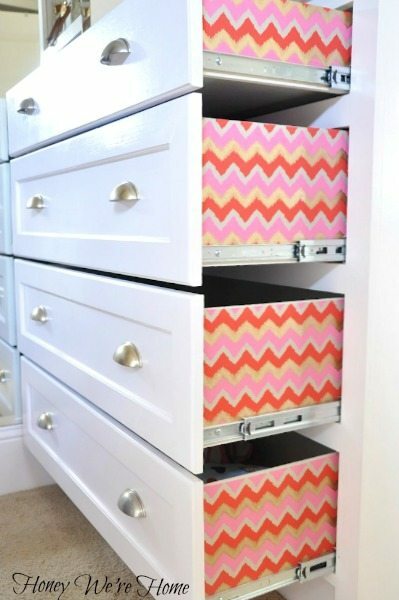 Love the fun chevron on the side of the drawers too! 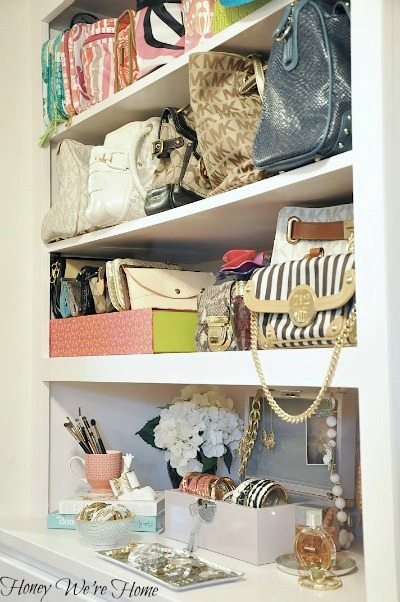 Your closet looks gorgeous! SO jealous of all those bags and jewelry! We organized our closet a few months ago and I have to say it has been such a time saver in the morning! So worth the time we spent doing it. I can see everything again and I get dressed so much faster. Like you, I purged things I was not using. We are now looking at expanding the closet some in an upcoming renovation…we'll be organizing again. 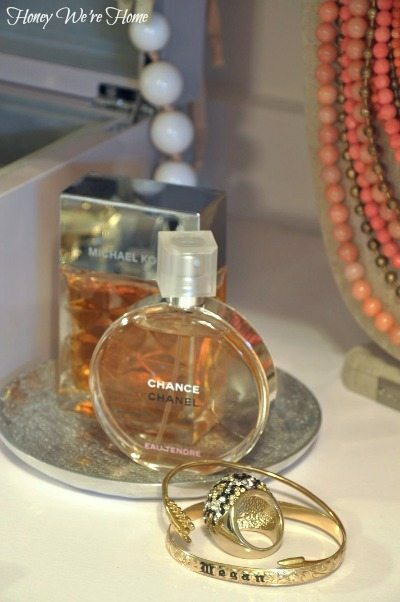 Oh, and I love Chance by Chanel. My favorite fragrance. 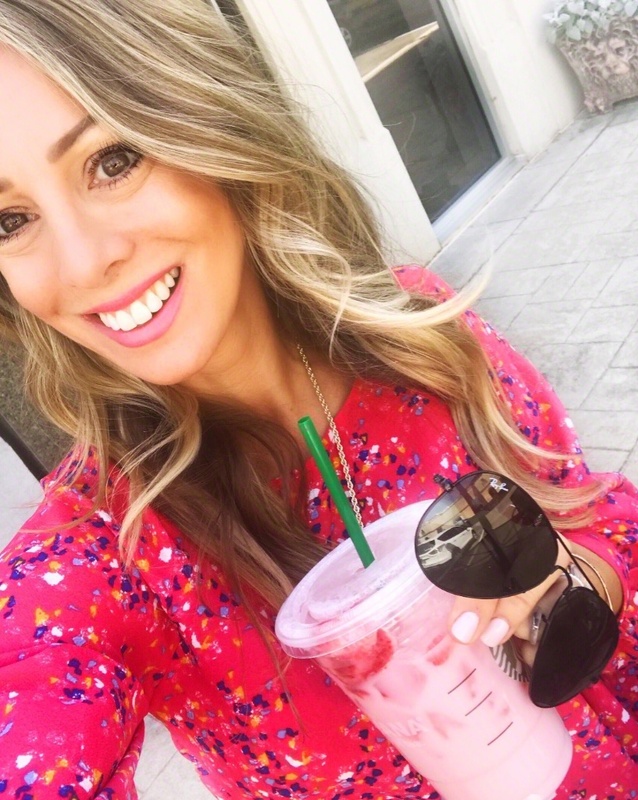 I was so glad I stumbled across it a few years ago…I wear a few other occasionally but I always love it each time I wear it! That is such a neat idea! When you sprayed the adhesive, did you have to tape off the rest of the drawer, or were you just careful? I'm thinking of doing this to all my kitchen drawers. So much potential!